Press release 8 / 2011: World novelty Trimobil: Modular Lightweight Vehicle Made in Germany. 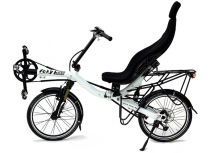 E-bikes, called pedelecs are absolutely trendy. But urban business e-mobility solutions are still rare, although placed at the top of 2020 agenda of any cities mayor. 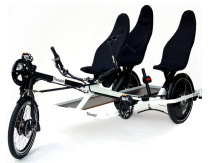 German Toxy recumbent company proves, that professional solutions are ready for production right now. 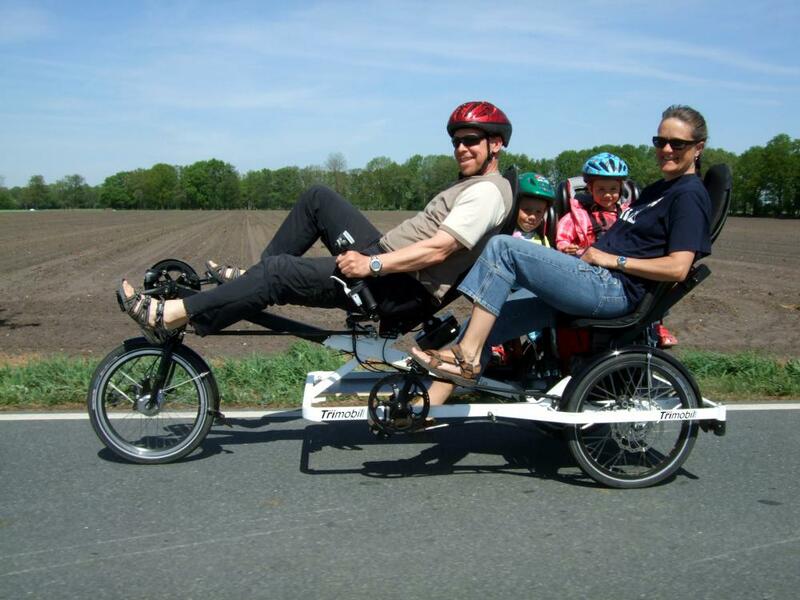 The innovative, specialized bicycle manufacturer presents this novelty at the world's largest bicycle trade show Eurobike in Friedrichshafen from 30 August: The Trimobil, an environmentally friendly tricycle for three passengers or commercial use with up to 600lbs load. 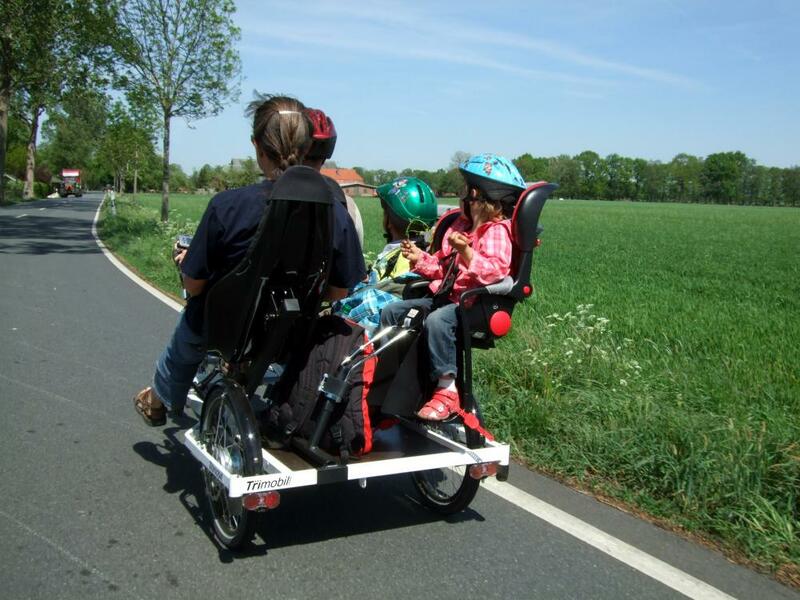 The Trimobil is very special not only because of its low weight and small dimensions: With only 2.40 m length it is shorter than many tandem bikes and can be parked vertically to save space in the garage. The width of less than one meter allows the use of bicycle paths in many European countries - even with the electric-assisted Pedelec option. 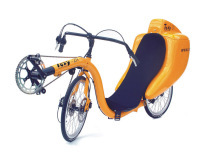 The Trimobil has only little in common with a conventional bicycle-rickshaw or a so-called velo-taxi. Even the classic rickshaw principle "one for all" has had its day off right away: the pedal power is devided between up to three drive trains: two independent pedal drives plus electrical assist. This not only relieves the pilot but also offers a lot of fun to the passenger. True to the Trimobil-principle: "sustainable, shared, likeable." 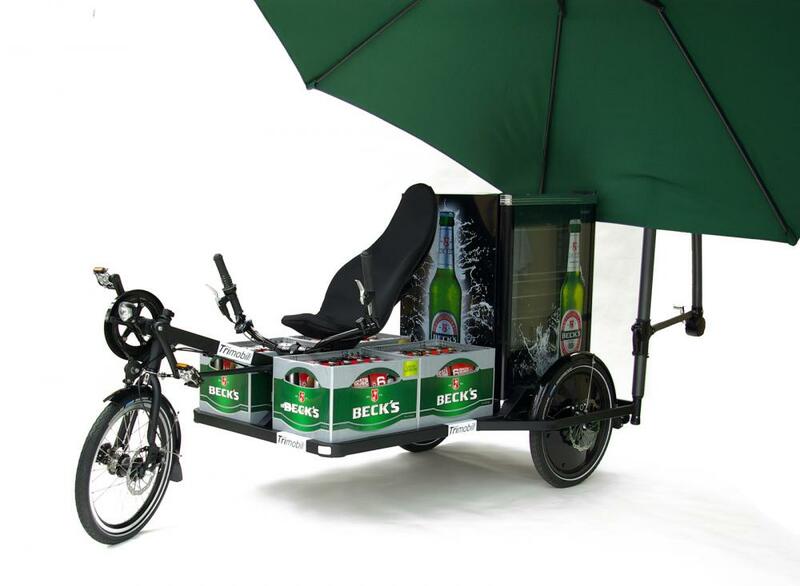 Also several industry solutions for professional transportation at factories, rental use in tourist areas (Trimobil "E. Rental") and promotional use in large cities are already at the show, including a flexible sales vehicle (Trimobil "POS") with beverage fridge (optional: ice cream box), large cargo area and advertising umbrella. Other options, such as a wheelchair-module for handicapped people, are under development and will be available next year. Each Trimobil can be customized with the online configurator at www.trimobil.net and than will be assembled individually. 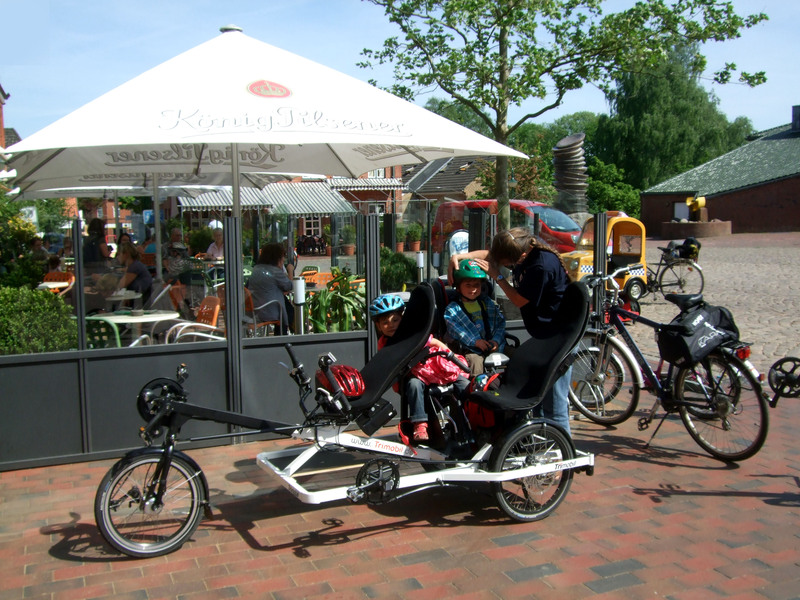 The different equipment options are interchangeable and can be retrofitted later, as required, with a few simple steps, such as when the next market day's purchases and the children (up to two plug-in standard baby seats) should be carried home at the same time. The energy-efficient, sustainable Trimobil concept hits a nerve of time in many ways, so the project is supported as an Environmental Innovation by the European Union and the German government. Smart cycling performance. Made in Germany. Since 1995.